Enjoy an evening of art and wine in the heart of city! 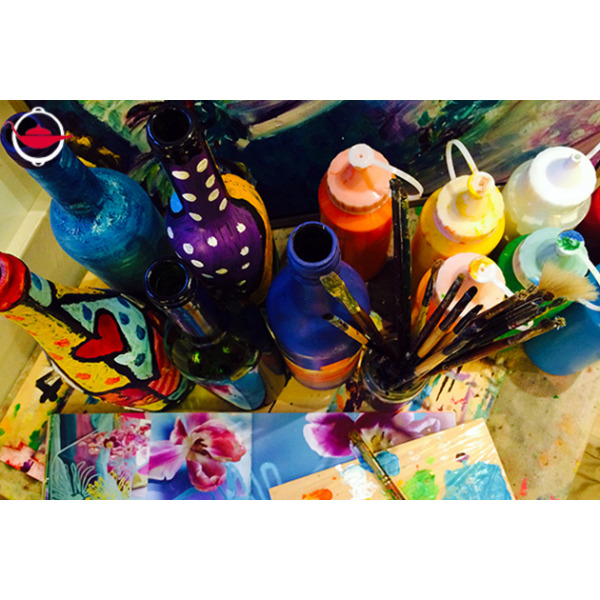 In this experience, you will come into the artist’s own studio to learn bottle art and bottle painting, while enjoying a glass of wine with your friend. 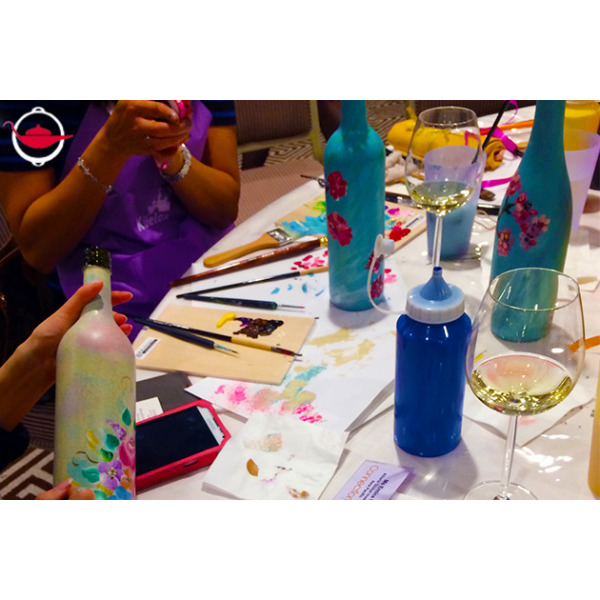 Enjoy an evening of art and wine with this 2.5 hour Bottle Art Workshop! Come with a friend and choose from a selection of glass bottles of different shapes and sizes to learn about glass bottle painting. In this experience, an instructor will be there to guide you and assist you with your glass bottle art. To help with your inspiration, you will be served a bottle of red or white wine to share between you. At the end of your experience, bring your glass bottle art home as a new décor item! You can use the bottle as an original water bottle when you have guests around, as a vase or as a cute candle holder. You will also have made a green contribution and learnt how to recycle glass bottles! 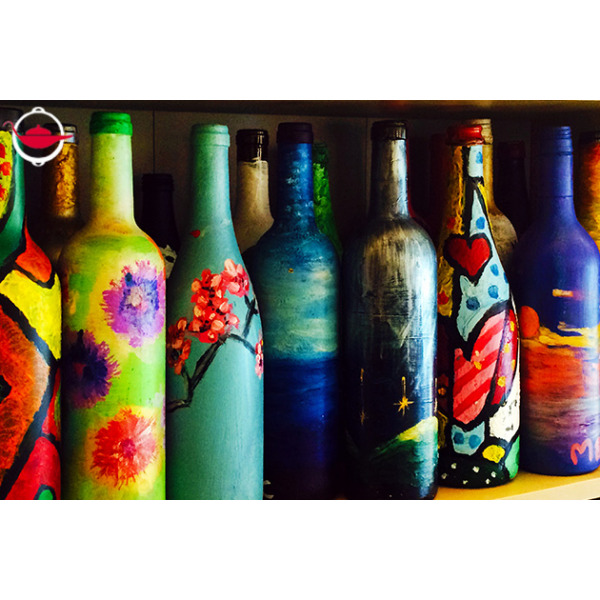 Come into this artist’s studio – a cosy and intimate creative space – enjoy an evening of bottle art and wine and let your imagination flow! This Experience Voucher is valid for 2 people in a private session. Additional participants may join at an additional cost of $280 per person, up to a maximum of 6 people. This experience lasts for 2.5 hours. Bookings can be made anytime. Bookings must be made at least 5 days in advance and are subject to availability. English. Cantonese and Mandarin upon request. Participants are recommended to wear casual wear that you are not afraid to stain. Aprons will be provided. This experience is suitable for people aged 18 or above. Q: Can I take my painted bottles home immediately after the experience? 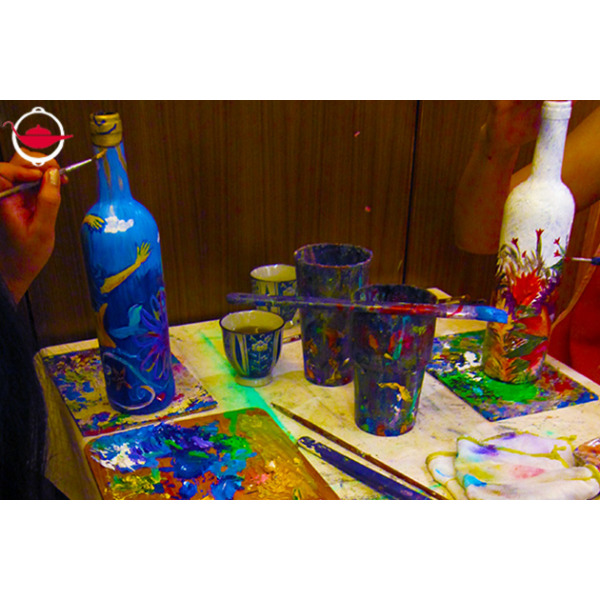 A: Yes, if you can finish your bottles and dry the paints within the experience time. Otherwise, you can leave your bottles in the studio and arrange to collect them at a later time. The studio will also provide wine bottle gift bag for you to protect your bottles. I got the experience from my company as an award. The artist was very nice and the place was cosy with nice music. Products for art were of good quality. Vin was good as well. Would have been great to have some apertizer food but understand this is not a restaurant. Artist shared nicely some cookies though. Maybe more guidance for beginners/ not artist people as my husband was struggling at painting (but it was funny). Very, very pleasant. Very useful as we learnt something new. 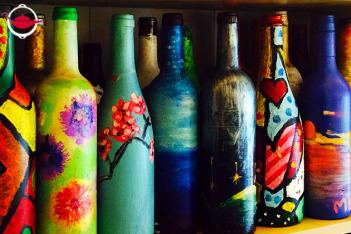 We would wish to cultivate bottle art as a hobby. Carol was a great teacher, we would highly recommend this experience to anybody wishing to find a relaxing yet very useful hobby. I had a great time painting my bottle. It was very relaxing. The place is so beautiful with a lot of art works. I can feel free to paint and relex in there. I heard about Spoilt from a WiFA Christmas Bazaar. I browsed the website in search of a gift for my sister who was coming to HK from the Cayman Islands to spend Christmas in HK, and I came across the Bottle Art. My sister loves art so i thought this would be perfect. We absolutely enjoyed the event! The atmosphere was so quaint and relaxing, the host was very welcoming and lovely and she gave brief intro on brush and stroke techniques for the benefit of those who had no clue what to do (i.e. me!). We had a great afternoon of painting, wine, tea and biscuits and we both left with a souvenir of the event. I'd highly recommend this for anyone looking for a nice, creative, relaxing afternoon. I only wish the session was longer as we had so much fun! My husband brought this experience for my birthday. Carole was an excellent host and teacher. Neither of us is artists and we'd never painted anything and she put us at ease immediately. Her art studio is set up beautifully with a very calm and homely vibe. My partner and I enjoyed the workshop much which can also alleviate our daily pressure from the works!! The instructor is very nice and friendly to share some painting skills and art info. We had an outstanding experience and a great deal. Our instructor Carole is courteous and attentive. The studio is also cozy and artsy. For $500 for two, we get to enjoy a bottle of chardonnay in 2.5 hrs of fun time! I had a great time with friends!! This is a good and interesting activity to show your creativity. The studio is very cozy and the instructor is very nice as well! Great way to get together with friends -- very fun to see how your good friends express themselves in such different ways! Carol, the business owner, was great at giving us tips for beginners but also gave us complete freedom to do whatever we wanted to. Loved this Spoilt gift!